infused syrups – Simple syrup doesn’t have to be so simple. Try infusing different ingredients for an elevated flavor profile, like a vanilla bean, fresh ginger or grated lime zest. Add a small amount of the selected ingredient to equal parts of water and sugar, let your mixture come to a boil, and remove from heat. Once cool, strain the syrup and store in refrigerator. Try using infused syrups over shaved ice for a sophisticated snow cone to beat the summer heat. 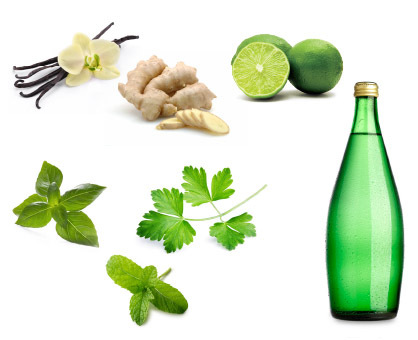 introducing herbs – Muddling herbs like basil, mint and cilantro adds a fresh element to any drink. These herbs complement most fruit flavors, including lemon, lime and strawberry, and go well with infused syrups as well. Be sure to use a sturdy muddler and sprinkle just a bit of sugar or simple syrup into the mixer to help break down the leaves. Once mixed with your selected juices and/or sodas, strain your drink into a decorative glass for a beautiful beverage! bright and bubbly – Adding a sparkling component makes any beverage feel light and invigorating. Top off your drink with a few splashes of club soda, and if you’re looking for an extra shot of flavor, try using flavored sparkling water. With a wide variety available, the bubbly, effervescent possibilities are endless.